Ionic bonding is the strong electrostatic force of attraction between oppositely charged ions. e.g. Ionic bonding in sodium chloride. 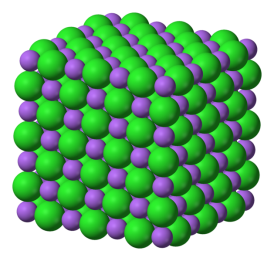 Ionic compounds form a giant ionic lattice held together by many strong ionic bonds. A similar structure is seen with MgO but this is stronger as the Mg2+ ion is bonded more strongly to O2+. High MP (melting point) & BP (boiling point) - there are many strong ionic bonds to break due to strong electrostatic attraction between oppositely charged ions. Crystalline - the ions are packed together regularly. Brittle - the arrangement of ions allows crystals to split easily. Soluble in water - Water is a polar molecule. These molecules are electrostatically attracted to the +ve (positively charged) and –ve (negatively charged) ions in the lattice, and pulls it apart. If the attractions between the water molecule are stronger than the attractions between the ionic lattice, it will dissolve.